This week’s Throwback Thursday is another photo from “Sammie’s Friends” envelope. I’m going through that envelope because some of the pictures do have names and dates on the back making it much easier to find people. However, this particular individual has proven to be a decidedly harder than the last to find. 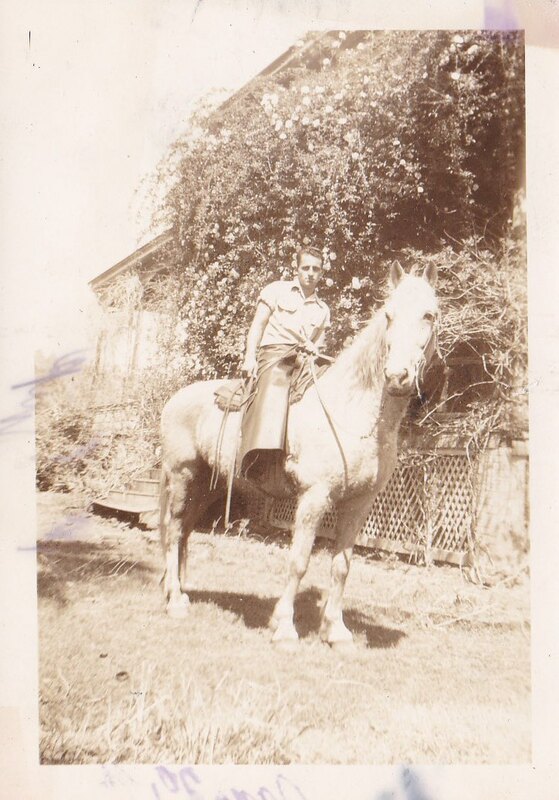 This week I found a photo of Wayne McCoy from April 2, 1944. I research for him on find a grave and google and didn’t find too much. Look at this cowboy! Isn’t this a pretty photo? Look at those roses behind that cowhand. I did find out that Mr. McCoy got married. 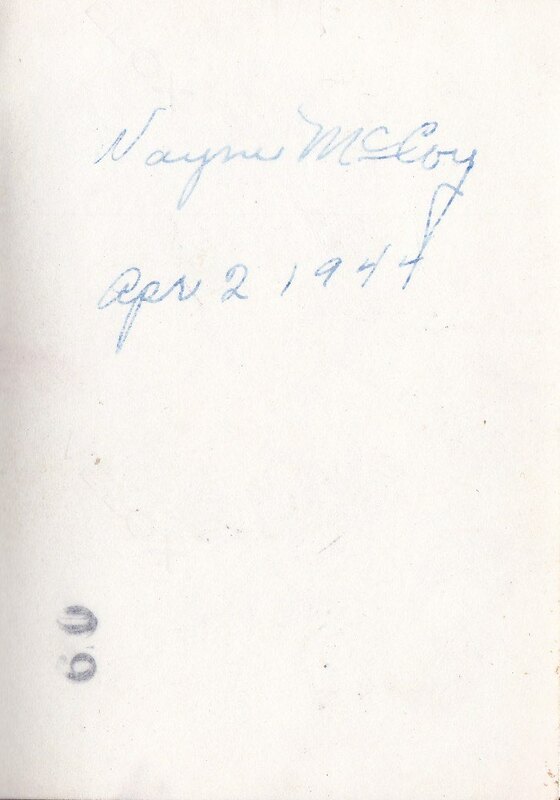 There is a Mrs. Wayne McCoy on a List of Prospective Trial Jurors For 1959 Made Public by Clerk. I know they had at least three kids, one being Vickie (she was born very close to Sammie Jr.’s death). I know he was in a car accident, with his Dad. But that is where my trail ends cold. I think this an unquestionably cool picture that he or his family would probably love to have! I know someone out there remembers The McCoy’s and possibly know where they are now. So again, I ask for your help Readers. What do you know about them? Please leave me a comment and point me in a direction. Thank you! Working dogs are essential to our way of life. Unfortunately, we lost one of our girls this winter and another needs to be retired soon. It’s not easy for us or the dog when it’s time for them to slow down or retire. The dog’s live to work, their greatest joy is just going. We usually end up spending more time with our dogs than we do any other person or animal. Our dogs are more than pets, they are our coworkers, our protectors, our companions and a part of our family. The day I brought her home. Deceptively innocent looking, isn’t she? We often joke that a good cowdog is worth two good cowboys or one cowgirl! By the third day she was home, she was already throwing parties in my house. We’ve known it was time for another pup for a while. I’ve been looking for the perfect pup to replace my Dad’s soon to be retired dog, Ranchie, for about a year. I paraded adorable puppy picture after puppy picture in front of my Dad, hoping he would be interested in one. My Aunt even brought one of her red queensland pups over around Christmastime, but to no avail. My Dad had a specific pup in mind, and after a year I finally found her. She quickly won us over with her inquisitive nature and puppy breath. Seriously though, those kelpie ears! My friend, Mindi, has a dog named Lady, that looks an awful lot like my Dad’s dog, Ranchie. I asked Mindi if she knew of anyone that had some good working pups, that looked like Lady, looking for homes. As fate would have it she did, and I immediately sent an e-mail inquiring about female pups. Mindi’s neighbor, June, e-mailed me right back. Turned out she had one female kelpie pup left. Fate. She sent me a picture of the pup. I walked over to my Dad’s house and flashed him the picture of the cutest little kelpie pup, I’d ever seen. Dad agreed. I found his new dog. Her first day seeing cows. She did so good! After her first day of following me working on the ranch. Tired pup! A few weeks after that I was able to pick the pup up for my Dad. It had been decided that I would care for and socialize the pup until she was old enough to start working. We generally start working dogs at a year. That means I am looking at a good six months of puppy sitting full time and another six of part time puppy sitting, only to turn her over to my Dad. She already figured out that bottle calves equal treats! Aunt Jinx taught her to swim in the ditches. Grandma Ranchie and uncle Bud are teaching her to swim in supplement containers. The great thing is, I work with my Dad so I’ll still see her and work with her everyday! But usually after a few months of working full time with my Dad a dog’s allegiance changes. You see these cowdogs are bred and born work, and they love and respect whoever the work with the most, in this case it will be my Dad. She’s wasn’t so sure about Dad, she really wanted to be back in MY lap. I’ve had this dog for a little over a month now, I spend a lot of time with her. I have to say, I am impressed with this dog and am seriously considering not giving her up. The force is strong with this one. Not even six months old, and she has this ranch dog thing pretty much figured out. Of course, I’ll give Boo to my Dad when she is ready. I still have a few good years left with my dog, Hoot, and I can tell how excited and proud he already is of Boo. I know how hard it is to watch a dog you love and depend on grow old and retire and am deeply pleased to be able to mitigate that for my Dad a whisper. I know Boo is the beginning of a long line of excellent Brown Ranch cattledogs. It’s been slow, but they are slowly bonding. I went to my local county cattlemen’s board meeting tonight. My blog was on the agenda because for the past few months I had been asked to use my social media savvy and create a Facebook page for the group. I’ve posted mainly fun facts and articles about the industry, but I figured since my blog post about California Beef Council dropping the social media ball directly impacted Butte County Cattlemen (since they all pay into the check-off), I’d post a link to my blog on the Butte County Cattlemen’s facebook page. Ready to talk the Board about my blog, change within the industry and facebook. Some of the members didn’t like that I did that. I understand that fighting and drama can look bad when done within the industry. But when you read my post about the California Beef Council, I feel like I am not really fighting or attacking. I offered my help, I want to get involved! I did point out that the beef industry has a problem when the group we fund to talk for us, won’t talk to us. So it confused me that these men took issue with my stance. I guess I thought more of them would be upset too. I found myself being the only woman and the youngest one there trying to explain social media, blogs, my blog, the story behind my blog, and how social media works to a group of men that, I think it is safe to say, don’t fully appreciate this technology, it was like talking to a roomful of my Dads. It got confusing. People interrupted me and told my story for me (although that part was kinda nice – I got to hear more about the drama I caused higher up, but I didn’t know because NO ONE WOULD TALK TO ME ABOUT IT). I got annoyed that I could have been sitting on my couch, with my cat and wine (Wino Wednesday! ), instead of being talked at about a thing I know and am pretty good at sometimes. I went ahead and printed off a couple of my blogs, the ag code that explains the California Beef Council’s job, and Todd Fitchette’s blog about my blog, hoping to give the board members some background into what I have been doing. I don’t think that helped, but I did try and do my due diligence to explain why I thought I was there. My packet of information about the California Beef Council. The meeting went on about if Butte County Cattlemen should even have a Facebook page. A side note, I asked how many of these men even had a form of social media and I think 4 out of the group of 10 or so did, one mentioned that he knew how to turn on a computer! I guess I do understand now, why these guys aren’t as upset at the lack of social media in our industry when they don’t understand what it is or how powerful it can be. I think by now, most of my serious readers realize I love ag, I love anything to do with it, and I spend an enormous amount of my time talking and sharing about it. I was honest and told them it really wouldn’t hurt my feelings if they removed me from their Facebook administrator because I do have my hands in so many different ag related activities. They said that they wanted me but they wanted policies and procedures, more regulation – no drama, no opinions, you know kinda the stuff that makes me such an amusing person. I told them that for a donation to my scholarship they could tell me what to post, and I wouldn’t piss anyone off. So about that time I burst into tears. Because when I am put on the defensive and not listened to, that is what I do. It was a highly effective tool to communicate with my Dad and since these men all reminded me of my Dad, I went there. I do hate that about myself, it makes me look very unprofessional, but it is also a huge part of who I am. However, want to know how to make a room full of cattlemen really uncomfortable? So that was my meeting. I think they decided to have a young cattlemen take over the page. I must question though, how many pages about the beef industry do we need that only talk about puff? How effective has that been? I went home after I started to cry. I’m on my couch with Jack cat, doing what I do best these days, writing about the odd predicaments I get myself into. I don’t feel like my point was gotten across. I feel like I am missing yet another opportunity to help my industry. I feel like I don’t know how to communicate with others in my industry, am I the only one that feel like this? Am I really the crazy one? Remember back a couple months ago when I got to speak to that group of FFA kids? And they were totally awesome and I was really excited? When I ended up being on their FFA Board – which is so much fun! Unfortunately because of my crazy schedule this time of year, I haven’t been able to be that active yet. All I can do is try my best to get some donations. You see, this little charter school wants to start their own school farm!!!! During a time when most schools are shutting down their agriculture programs, this one is trying to start one!!!! So if you have some extra money or farm equipment or anything to help won’t you consider helping them out? I’m attaching the letter they sent out to local business’s so you can see I am being totally serious. Please contact Ms. Anderson or myself if you want to donate. Again, thank you, thank you, thank you! Let me start by saying thank you for your time. The reason I am sending you this letter is to ask for your support and help. I am privileged with the opportunity to start a new FFA and Ag program at the CORE Butte Charter School in Chico. The Charter school allows students to have the opportunity to develop an education program that fits their learning style while having the time and flexibility to pursue those passions that interest them as well. With FFA and Ag being such a huge leadership and skills building opportunity, and the dynamics of the Charter school allowing student to get involved- blending the two is a phenomenal new precedent we are setting. FFA is the Future Farmers of America. In FFA students have the opportunity to develop leadership skills which they can use for the rest of their lives no matter the career choice. Students have the opportunity to participate in events like job interview, public speaking, judging contests, and so much more. Students can also run for office, raise animals for fair, develop their own business through entrepreneurship- the possibilities are limitless. Developing a new program is exciting and challenging. Based on the nature of CORE being a charter school we do not qualify for state funding. Which is where YOU come in! We are looking for companies and businesses to support our program and grant these students this tremendous opportunity. We have been fortunate to acquire a school farm and are now in the process of building it. Building a farm from the ground up is an exciting and huge task. We are asking for donations and support to our farm in any way possible. Whether it be gravel for our road and ag complex, drip irrigation supplies, lumber for animal houses and planter boxes, soil for the planters, floral supplies, rubber mats for stalls, hoses, animal science supplies, etc. we are appreciative for any support we can receive. Every bit of support is much appreciated. Your support will be used to develop and grow the Ag department and provide students this unique opportunity of “learning by doing”. Students have the opportunity to not only work out at the farm but experience ag in a hands on way. It is community supporters like yourself, which make the dreams and opportunities for students a reality. With your support, in return, we will add your name to our sponsor list on all event paraphernalia, our event banners that are displayed at fairs, community events, and FFA events, as well as to our website. Thanks you for considering and supporting our future agriculturalists and leaders of tomorrow.